In Pelhourino, the historic centre, beautiful, but apparently dangerous – someone waved us away when we tried to go down a slightly deserted street in Salvador – nice of him to tell us, but now we are completely paranoid… Saw 2 amazing churches and took the Lacerda elevator to the lower city (another mode of transport :)). Found a lovely restaurant with garden and live music to have our Valentines meal in, this must be my most exotic Valentine location…. … What do points mean… prizes! I’m sure I’ll lose the valentines points before long! We decided to get some breakfast, which turned into lunch, and then see Christ the Redeemer. Got there at 11 and apparently no free trains until 5! Keir is hoping to see a football match tonight, so decided to go to Sugar Loaf Mountain instead, which needs 2 cable cars – hooray! 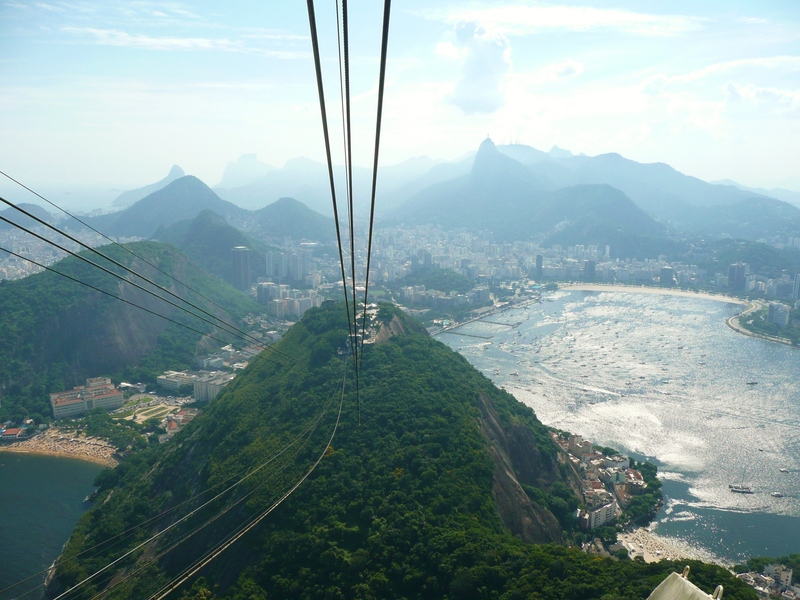 Expensive, but amazing views, Rio really is beautiful. Met some Canadian cruise shippers, it seems 5 cruise ships turned up today and that is why we couldn’t get on the train – bastards. Was going to meet up with a friend of Gareth’s to see the Botofogo/ Flamengo game tonight – rushed back from Sugar Loaf to pick up the details on facebook ; got lost on the way & our bloody receptionist had popped out & locked up reception so that we couldn’t get into our room for 20 mins…. By then it was too late to make it across town to meet up….. arse… a bad review on tripadvisor is looming for this place! Booked the train for Christ at 9 on the internet and just made it! In a carriage with another cruise ship, wow, how many of these guys are there? The statue was cool, had the obligatory ‘arms out’ photo taken by Keir and photographed more stunning aerial views. Then caught the bus to Ipanema beach (a long, hot and sweaty ride – not in good way ;), def taking the metro back, it is air-conditoned!). After Ipanema, and an abortive attempt to see a fort (do you think Keir will suspect I am sabotaging his attempts to see them? ), Copacabana. Arrive back at pousada for a ginger cachaca to find we are both rather burnt, despite the factor 50. Ginger genes – Keir is worse than I. Missed the football…. Didn’t get to see a fort…. It’s almost as if some invisible force is preventing me from seeing the things I want to see…..?! Stumpy & Tracey – what an amazing itinerary! On a cold and foggy day here in Canary Wharf your blog has brought a smile to my face and brought back some fond memories of my trip 13 years ago! Just one request…please can we have some photos??? I’m following you with envy!!!!! Hopefully I’ll be able to join you at some point in South America. I second the photo request. But rest asssured, Tracey has done nothing else but take sodding photos…, we have photos coming out of our ears! Click the ‘Add Media’ button top left, then find your photo files (can be on usb/flash/mediacard etc), then tell the post where to display them – left, right, inline, not inline and add a caption for top hilarity effect! Any problems with wordpress, just drop me an email and I’ll be happy to help. Well done so far, enjoying following your progress (you lucky buggers).